Let’s be real. We ALL indulge in the occasional food sin. When sensitive skin is involved, however, overindulgence can lead to potential problems. Protecting your sensitive skin requires studying foods that could be potentially detrimental to your health and wellness. Knowing which foods to avoid may go a long way in preventing unwanted acne outbreaks and inflammation. There are foods on the market with excessive amounts of salt, sugar, fat and preservatives that should be avoided, even in very small doses. Canned foods, for example, are often too rich in salt and preservatives, precisely because they have to last for a long time, while maintaining color and flavor. Beware of processed cheese that is industrially produced with a mix of milk fats, additives and preservatives. Carefully read the ingredients of seemingly “good for you” fruit juices, which instead of containing actual fruit, may be loaded with sugar and artificial coloring. To assist you in your quest for quality food choices, Organyc has collected a list of potentially disruptive foods, which may prove damaging to delicate skin. As you prepare your shopping list, please keep in mind how you can avoid the following products, while substituting them with healthier elements. White sugar: White sugar, hyper refined, besides being highly caloric, increases blood pressure (like salt), modifies your metabolism and creates problems to your liver and heart. It is also correlated to memory loss. Excessive use could even cause diabetes. Some researchers even claim that it is as harmful as smoking and alcohol (in addition to the fact that it is addictive). As an alternative to white sugar, consider opting for brown sugar, maple syrup, apples, or honey. Also beware of refined desserts and cereal. It is advisable to replace white bread and pasta with their respective integral versions. Make sure you keep away from sugar and limit your dessert intake. Sweets and refined cereals increase the skin’s tendency to become inflamed and irritated, because they excessively stimulate the production of insulin, a proinflammatory hormone. 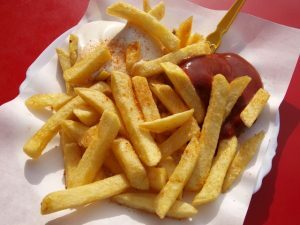 Fried foods: Fried foods, although very tasty, should be avoided. If you must fry, it is always preferable to fry in extra virgin olive oil compared to other types of oils. Frying requires high temperatures and an abundance of oil (or, in worse cases, butter, lard or margarine), which foods tend to absorb during cooking, making the digestive process more difficult. These foods also have a very high caloric content. Choose alternative cooking methods, such as grilling vegetables instead of frying. Carbonated soft drinks: Avoid carbonated soft drinks at all times. Consuming this type of drink can inevitably lead to weight gain. In one can of soda, there are 39 grams of sugar, which is an exaggeration for a single can. Another negative effect is the lowering of the level of potassium in the blood, which may lead to serious heart problems. Furthermore, the acids contained in soft drinks damage tooth enamel and negatively affect the hydrolipidic balance of the skin. Cold cuts: This industrial food, typically subjected to elaborate processing and poor in terms of nutrition, is often rich in salt, additives, hydrogenated fats and preservatives, making consumption extremely unhealthy for skin. Dairy products: Make sure you reduce the consumption of milk and dairy products, such as cheese, yogurt and other dairy products. Similar to foods rich in sugar and fat, dairy products may lead to acne and other skin disorders. Skin wellness is significantly affected by the food choices you make on a daily basis. Choosing carefully what to eat can either enhance the compactness of our skin or worsen irritation and blemishes. In a diet that aims to reduce skin impurities and imperfections, make sure you monitor the consumption of some pro-inflammatory foods, which negatively affect the hydrolipidic balance of the skin. Next week’s blog article will discuss foods that promote skin health. Until then, please feel free to leave a comment about which foods you avoid as they irritate your skin!